Place date paste, syrup, vanilla and salt into a food processor and process until smooth. Add the avocado and process until blended. Scrape down sides with a rubber scraper occasionally to make sure everything is mixed well. 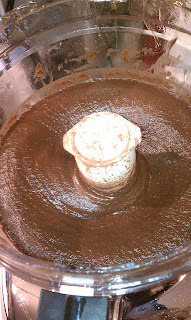 Add the cocoa powder and coconut oil and process. Pour the blended mixture into 6 ramekins, cups or mugs. Chill for at least 2 hours before serving. Will keep for 5 days in fridge if covered. Place the dates in a large bowl and cover with the water. Soak for 20 minutes. Soften the dates in the water by massaging them with your hands for a minute. Drain the dates, but reserve the water. Place the dates and 1/2 cup of reserved water in a food processor. Process into a smooth paste. The paste will keep for 2 weeks stored in the fridge and 1 month if stored in the freezer. 1. Put popcorn in a very large bowl. 2. In a microwave at 50% power, melt chocolate chips, peanut butter and butter until smooth. Stir in vanilla. 3. Pour chocolate mixture all over popcorn. Stir until all of the popcorn is evenly coated. 4. Spread coated popcorn onto a baking sheet and place in refrigerator for about 30 minutes or until the chocolate is set. 5. Break up into pieces and serve. Store leftovers in an airtight container. It's March 1st, so spring is officially only a few short weeks away. Today was a nice, sunny day, and it makes me want to begin spring cleaning! Where to even start? Today I shampooed our carpets upstairs. Yesterday, I washed all of our bedding in our bedroom and the guest room, including duvet covers, shams, blankets, pillow protectors, you name it. I've found that adding a scoop of baking soda to the wash makes things come out so much fresher when I wash them. I'm also a huge fan of Oxy Clean. For each load of wash that I do, I put in half a scoop of Oxy Clean and 3/4 of a scoop of baking soda. I just pick up the huge containers of both at Costco. You can do so many things with baking soda, so I don't think you can ever have too much on hand. For many years, I've been dishing out tips to friends and family about how to clean, organize, cook, make crafts and so on. I've had more than one person say, "You should really start a blog and post your tips for everyone." I did agree it was a good idea, but I never got around to it. Back in December, after handing out homemade Christmas gifts to all our friends at our annual holiday party, our friend, Matt Bobenchik, coined me "Martha of the Main Line." I thought that was pretty clever, hence the name of this blog. So thanks to Matt for his creativity and humor in giving me the seed to get things started. I've never blogged before, so this will be a learning experience for me. I have more than enough tips in the back of my head, so I shouldn't have too much trouble coming up with ideas for blog topics! We'll see how this goes. If you have any questions for me, let me know and I'll see what advice I can dish out.